A couple of days ago I posted about dessert oatmeal (which by the way I’ve had two more times this week) and said to use natural peanut butter. I was thinking about it later and realized that some people might not know what I mean by natural peanut butter. So here’s a bit of background. There are only two ingredients: peanuts, salt. PEANUTS, CORN SYRUP SOLIDS, SUGAR AND SOY PROTEIN, CONTAINS 2 PERCENT OR LESS OF: FULLY HYDROGENATED VEGETABLE OILS (RAPESEED AND SOYBEAN), SALT, MONO- AND DIGLYCERIDES, MOLASSES, NIACINAMIDE, FOLIC ACID, PYRIDOXINE HYDROCHLORIDE, MAGNESIUM OXIDE, ZINC OXIDE, FERRIC ORTHOPHOSPHATE, AND COPPER SULFATE. What is all that stuff? Personally I would rather eat the full fat version. Most of the fat in peanut butter is healthy fat anyway. So when you run out of your regular peanut butter, consider buying the natural version. The only differences are that it should be kept in the fridge and you might have to stir it a bit before you use it. 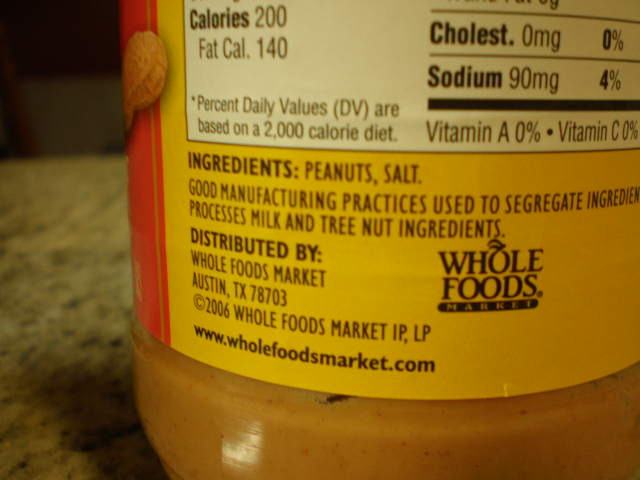 It’s available at pretty much every grocery store right by the regular peanut butter. You do not have to go to a health food store to get it. Most of the name brands make a natural version these days, but make sure to read the ingredients. The word “natural” on the front doesn’t mean anything. That word is not regulated like the word “organic”. 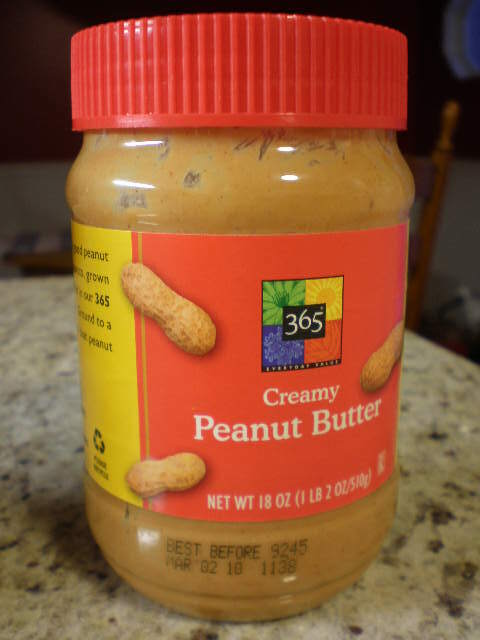 I will also say that I’m a bit frustrated with the 365 brand of organic peanut butter. I would like to buy organic but all the organic kinds have other stuff in them like palm oil. Why can’t it just be peanuts? Even the no-salt brand has something extra in it. That’s why I always end up with the salted version, even though I would prefer no salt. What is your favorite brand of natural peanut butter? P.S. I finally updated the “About” page. Click the tab at the top to learn more about me. I’m still getting used to this new blog with the fancy tabs! My favorite natural peanut butter is the organic, unsalted variety that my co-op grinds themselves! It’s soooo delicious & doesn’t have anything added to it. No oil, no salt, no nothin’ but peanuts! Other than that, I really like Maranatha brand. I have always wanted to try that “grind-it-yourself” peanut butter, but I’ve been a little scared of operating that thing. Maybe I’ll take a stab at it this weekend because I’m about out of PB. Thanks for the suggestion!